Thanks to everyone who attended my Code Camp 16 presentation this morning in Waltham, MA. As promised, here is the slide deck (in PDF form) of my presentation. Also – for those who wanted the complete sample application used to demonstrate during this session, please visit the “Get to Windows Phone 7.5 #7: Using Push Notifications with Secondary Tiles and Deep Toast” tutorial on the App Hub web site. 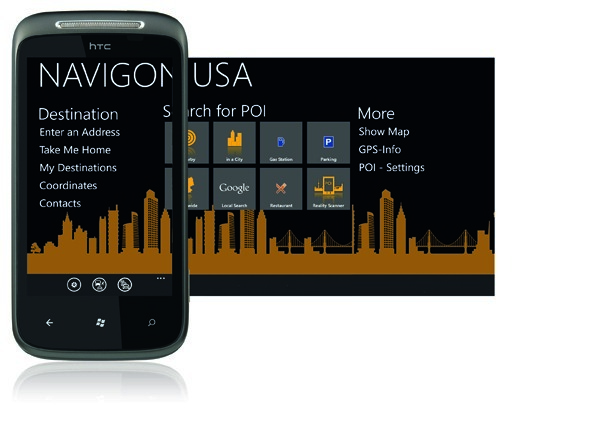 NAVIGON (my current favorite in mobile navigation) has launched the first on-board navigation app on the Windows Phone 7 smartphone platform. This means the application won’t consume data downloading maps similar to a stand alone GPS, the maps are downloaded onto your device upon installation. The application is available now in the Windows Phone Marketplace at an introductory price of $29.99 until 11/15/11 when it will return to the regular price of $49.99. This first to platform full featured Navigon app includes spoken turn-by-turn directions, visual lane guidance, live traffic information and rerouting provided by INRIX, as well as many other features. NAVIGON’s new app runs on Windows Phone 7.5 and also takes advantage of several new features now made available to developers with this new release. These features include the augmented reality function Reality Scanner, which provides an instant and effortless way of identifying nearby destinations while on foot; an option to select address information directly from the phone’s contact list; and the ability to save a favorite or home address as a shortcut on the start screen. NAVIGON MyRoutes: The app includes routing technology built upon NAVIGON’s 20 years of experience in the navigation industry, so users get the most reliable routes available. The MyRoutes feature provides customized route suggestions with up to three different choices based on the user’s driving style. Reality View Pro and Lane Assistant Pro: Reality View Pro feature clearly displays photo-realistic views of actual highway/interstate signs, exits, and lane guide markers so users can see lane changes and exits in advance. Lane Assistant Pro prepares drivers to make an upcoming exit or turn with a lane map complete with arrows and actual road geometry. NAVTEQ® maps: NAVIGON for Windows Phone 7 uses one of the most robust and accurate geographic databases in the world, providing the most accurate map data and points-of-interest information. 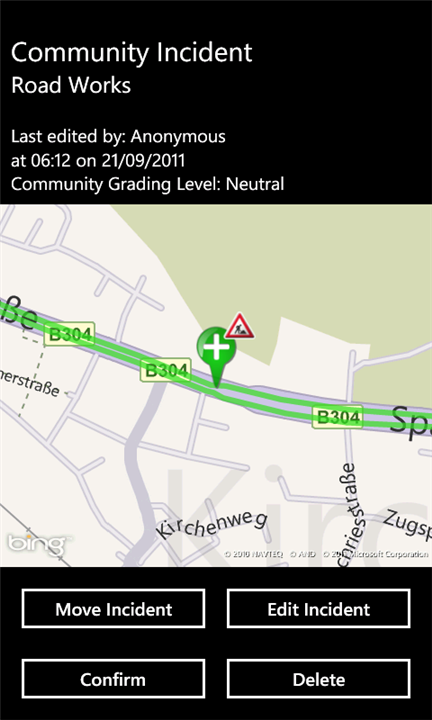 The superiority of NAVTEQ® maps is defined by its verified accuracy, content richness, and its breadth of coverage data. 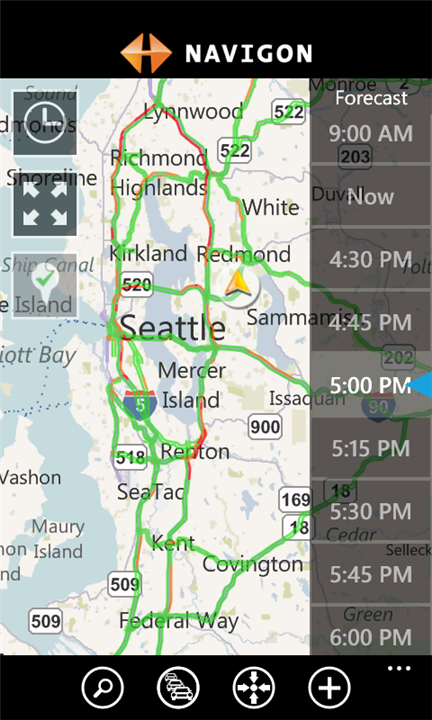 Traffic Live: NAVIGON for Windows Phone 7—using real-time traffic information available from industry leader INRIX—alerts drivers to traffic problems and automatically calculates alternative routes so they can avoid congestion and save time. Reality Scanner: Reality Scanner is an augmented reality feature, providing an instant and effortless way of identifying nearby destinations. Users simply point their smartphone in any direction to see points-of-interest icons appear directly onto a live camera view, making it easy to find destinations on foot. NAVIGON Shortcut: Save any address as a shortcut to the Windows Phone 7 start screen. This allows users to start navigating, for example to their home address, with only one click. Speed Assistant: Drivers can potentially avoid costly tickets by receiving alerts when they’re speeding and getting notified of speed and red light cameras before they pass them. 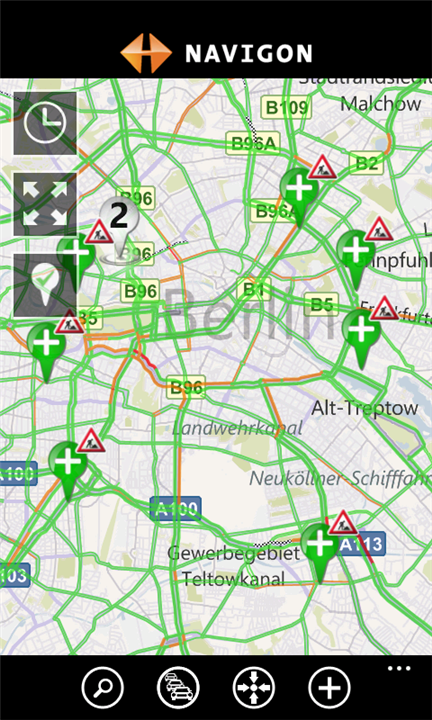 traffic4all uses traffic information from NAVIGON’s partner INRIX. The leading traffic expert covers more roads than any other provider, delivering real-time traffic information that extends beyond major highways and interstates covering more than two million miles in North America and Europe. Hamburg, Germany, October 11, 2011,—NAVIGON AG, a leading provider of mobile phone on-board navigation, today announced the launch of the first on-board navigation app for Windows Phone 7 smartphones. NAVIGON’s app is available for Windows Phone 7.5 users and takes advantage of new features made available to developers with this new release such as the ability to save an address to the start screen. 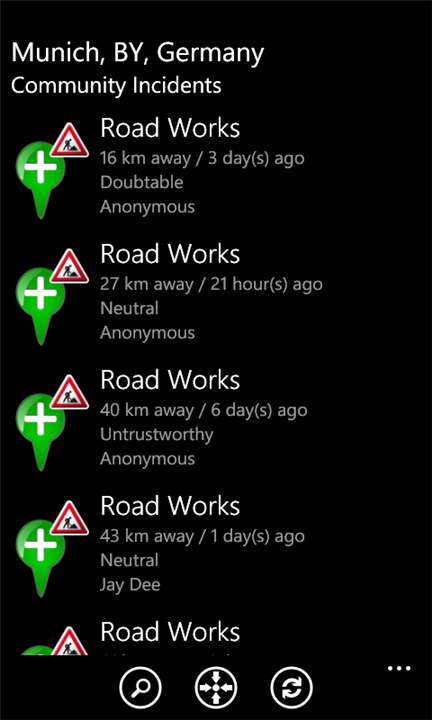 In addition, NAVIGON also launches a free traffic app for Windows Phone 7, traffic4all. NAVIGON for Windows Phone 7 includes spoken turn-by-turn directions, visual lane guidance, live traffic information and rerouting, among many other features. NAVIGON’s new app runs on Windows Phone 7.5 and also takes advantage of new features made available to developers with this new release. 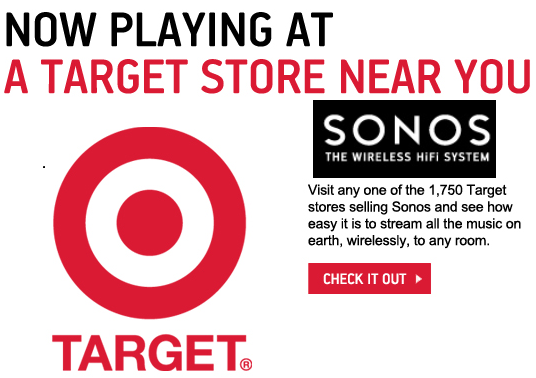 These features include the augmented reality function Reality Scanner, which provides an instant and effortless way of identifying nearby destinations while on foot; an option to select address information directly from the phone’s contact list; and the ability to save a favorite or home address as a shortcut on the start screen. Additional features include Google Local Search, which allows users to find local points-of-interest instantly; one-tap access to help users find critical services such as hospitals and police stations in case of an emergency; and the ability to select address information directly from the phone’s contact list. Microsoft is delivering two days of full of instruction on everything you will need to know on how to develop a Windows Phone application at the Marriott Boston in Cambridge on the October 12-13th. 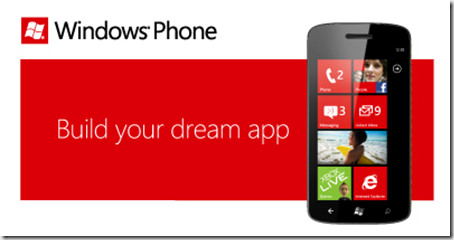 Windows Phone 7.5 (codename: Mango) is here – and we want to give you the upper hand on this new release. Windows Phone Camps are free, hands-on events designed to deliver everything you need to develop and publish a Windows Phone application. The camps are ideal for students and seasoned developers alike, whether you create for Windows Phone, Android, Symbian, Web OS, or iPhone. Interested in making money? We'll lead discussions on how to earn money from your applications and generate buyers for your apps. 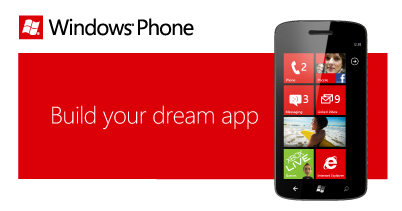 We'll also be sharing recent innovations, inside tricks, and a wealth of Windows Phone know-how. Don't miss the new Windows Phone 7.5 (codename "Mango") features as well - with detailed sessions in the afternoon around Fast Application Switching, Multitasking, Live Tiles, Push Notifications, and more. The day will be capped with an open lab hands-on session and prizes for apps completed. This is the perfect opportunity to begin work on your dream application, or finish that app you've already started, with Windows Phone experts there to guide you every step of the way. Bring your own laptop to join in the fun and show off your killer app! To register for Day 1 head here. The second day will be capped with an open lab hands-on session and prizes for apps completed. This is the perfect opportunity to begin work on your dream application, or finish that app you've already started, with Windows Phone experts there to guide you every step of the way. Bring your own laptop to join in the fun and show off your killer app! We will have lightning talks with noted industry experts, experts in migrating apps to Windows Phone, and cloud experts on hand to talk about scaling your apps through cloud solutions. To register for Day 2 head here.